Eight days after leaving Lizard Island, we are now 280 miles south, just outside Townsville. 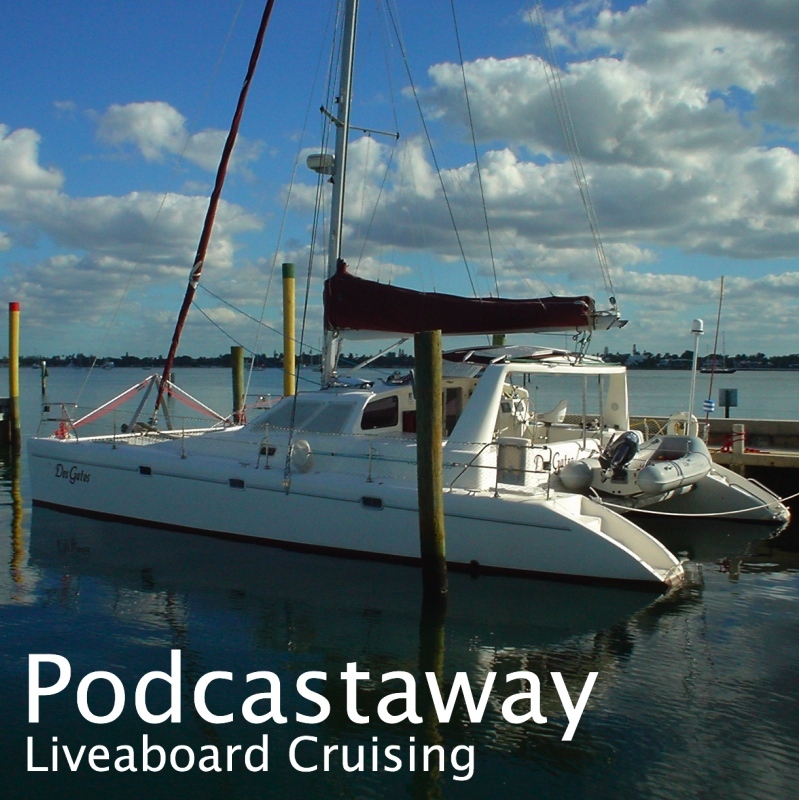 It's been a pretty uneventful trip, motoring or sailing south in 10-15 knot winds. We revisited several anchorages we'd been to on the way north, and a couple of new ones that we'd missed. Last night we stopped at Orpheus Island in the Palm Islands Group, after retracing our way back through the Hinchinbrook Channel. On the way north we bypassed the Palm Islands while we were out on the reef. Tonight we're at Magnetic Island, a few miles outside Townsville. The winds are forecast to be 15-20 so we'll stop here until they quieten. Magnetic Island in a major tourist center. Horsehoe Bay, where we anchor, has a couple of restaurants and a shuttle bus service to other places on the island. We plan to refuel in Townsville. I've been watching fuel levels carefully as we haven't bought fuel since we topped up at Cooktown nearly two months ago. We're hoping that a fill up in Townsville will last us until Bundaberg - around 500 miles. We made it! 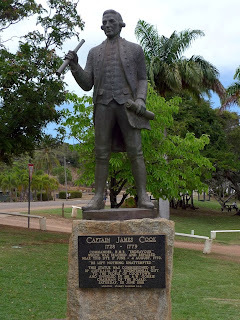 We're in Cooktown admiring the statue of Captain Cook - and raiding the supermarket. We moved around to Mermaid Bay on Saturday to make a night dive on our final day in Lizard. But next morning, the pesky Met Bureau had raised their wind forecast (from 10/15 to 15/20 - when the wind's on the nose, that's a big deal.) So we stayed the day in Mermaid Bay and made another night dive. The next morning the Met Bureau had done the same thing again! This time we said "$%$# them" and set off anyway. This was a bit of a mistake. They were right and we were wrong. We bailed out after 18 miles and anchored at Cape Flattery. The next day the forecast stayed at 10/15 and we had a comfortable motor the rest of the way to Cooktown. Now we've stocked the larder, had a meal out, and we're ready to set off south again. We're expecting to find more reliable light winds further south, this northern section of the Queensland coast seems to have steady strong trade winds most of the time. We've been stuck here in Mrs Watsons Bay at Lizard Island for over two weeks. It's blown over 20 knots the whole time and sometimes over 30. There was a brief gap between the weather systems - high pressures moving across the Tasman Sea - but the winds only relaxed for a day. We've dived every dive (no comparison with the outer reef) hiked every hike, and snorkeled every snorkel. Fresh veg is running low - it's been nearly 6 weeks since we left Cooktown. Of course, we haven't actually run out yet, and we have plenty of other food, but Ginger's meal options are steadily reducing! We've been to the outer reef exactly twice - for 2-3 days, and 5 dives, each time. In the next lull we have to head south. It's now officially Cyclone Season (although no one expects to see a tropical anything until Christmas) and we have over 700 miles between us and Bundaberg. We're hoping that in the next calm period we can visit Ribbon Reef #3 - about 50 miles south. Then, when the weather kicks up, we'll head into Cooktown to shop for veggies! We managed another trip out to the Great Barrier Reef. This was only our second excursion in a month at Lizard Island - there have been stronger winds in this area than is usual at this time of year, we're told. 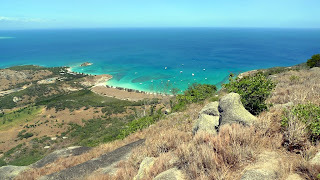 This time we spent three days at the gap between Ribbon Reef #10 and Ribbon Reef #9 around 24 miles southeast of Lizard Island. We made five dives on three sites during that stay and anchored overnight at the back of Ribbon Reef #10. For diving we borrowed moorings placed by the commercial liveaboard dive boats that visit the area. Two dives were pinnacles - Lighthouse Bommie and Pixies's Pinnacle. In both cases, a pillar maybe 50' across rises straight off the bottom at 90' to within 10'-20' of the surface. Lighthouse Bommie is undercut near the surface so it looks like a mushroom. The water was clear and there were huge numbers of fish schooling around and hiding in the crevices. The other dive we think is called Challenger Wall - but it isn't much of a wall. It's near the channel out into the Coral Sea so it can have current - and also lots of fish. These two dive trips have been good but it's a pity we've made only two trips in a month at Lizard Island. Between these trips we've sat in Mrs Watson's Bay in 25-30 knot winds!